A room in an early version of Super Mario World's Wendy's castle (top), and the final room, which appears in the final game (bottom). Pre-release and unused content are components of a video game that, for whatever reason, are removed or altered before that game is released. Known info about pre-release elements usually comes from one of two sources. The first is information released about a game by its creators before the game is complete. The second is data found within the data of a game that serves no purpose but could have been implemented into the game at one point. Prototype (version) / early version / Pre(-)release (version) = A non-final version of a game or part of a game. Pre(-)release (version) is sometimes used to specifically mean an early version that is seen in pre-release materials. The writer should be make clear what is meant. Pre(-)release material = Screenshots, videos, interviews, and others depicting or describing a prototype version of the game or the game's development history. Unused = Content that is in the game data, but not used. Cut/scrapped = Content that was in a prototype version, but is absent in later builds. Also includes content that was planned to be or suggested to be in the game, but was never actually implemented. The writer should be make clear what is meant. Beta = not to be used unless a version is actually a beta version. Should not be capitalized (unless as part of names that are capitalized or at the beginning of the sentence, of course). Pre-release elements should not be confused with unreleased media, entire games which never see release. To some extent, this can apply to television shows and movies. 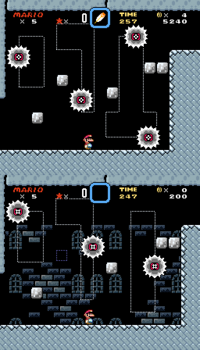 For example, there were some early depictions of characters and deleted scenes found for the Super Mario Bros. film, which can be often found in the special features section of DVD releases. The full list of pre-release content can be found here. This page was last edited on January 18, 2018, at 16:11.